Last night, the Oregon Ducks snapped Florida State’s 29-game winning streak, beating the Seminoles 59-20 in a lopsided Rose Bowl victory. It was the largest loss ever by a defending national champion. 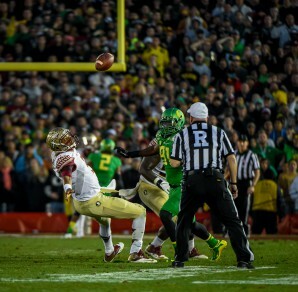 FSU Winston says Ducks defense did not stop the Seminoles “at all” during Ducks Rose Bowl rout, 59-20. 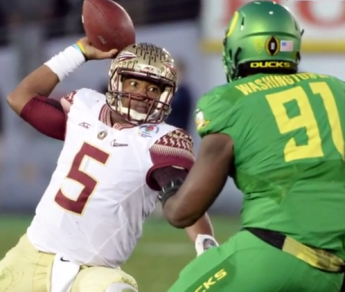 So what did FSU quarterback have to say about the Ducks’ performance? 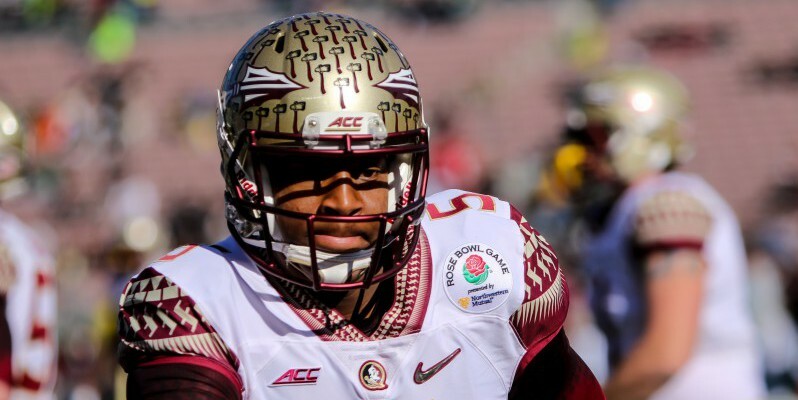 The post-game responses from FSU quarterback Jameis Winston are confusing at best and at times, just plain arrogant. “This game could’ve went either way. If everybody in this room wants to be real themselves, this game could’ve went either way. We turned the ball over a lot, you know. We beat ourselves. Just be real with yourself. We beat ourselves,” Winston said. Winston clearly is not accustomed to losing, something he hadn’t experienced before yesterday’s Rose Bowl game. 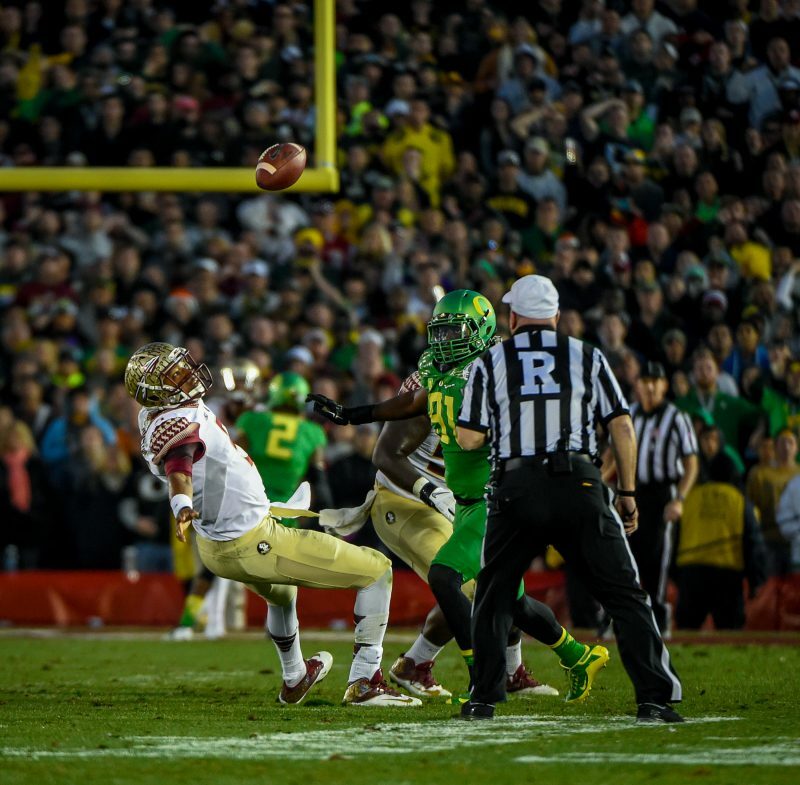 Oregon’s defensive line pressure was relentless, forcing seven fumbles, four of which FSU lost. And the fumble Winston lost was returned by Oregon’s Tony Washington for a touchdown. “Tonight was unfortunate. It wasn’t just like they were stopping us. Their offense did great, their defense was great, but we were never stopped, at all,” Winston said. Winston completed 29 of 45 passing attempts, throwing for 348 yards, one touchdown and one interception. Winston was sacked twice and the Seminoles were stopped repeatedly by a furious Duck defensive front. It was more about bad FSU than Oregon, but he’s still wrong, Jameis Winston that is, about what he just said because despite the bevy of mistakes that were inexplicable, that were embarrassing, that were just nauseating to watch. The fact is, Oregon deserves a hell of a lot more credit than he’s willing to give them. And I would strongly advise him in the future: you know, you can’t walk around having that kind of swagger and that kind of attitude immediately after getting stomped by 39 points in a national semi-final. I mean [Winston] just looks like a damn fool. —I said it, and I’m gonna say it again: he looked like a damn fool saying something like that. It just don’t make any sense. You just got stomped by 39 points. Show a bit of humility and acknowledge the fact that the Oregon Ducks who walked into the game as the No.2 team in the nation beat ya down. For anyone who watched the Rose Bowl last night, Winston’s comments come across as sour grapes, a stubborn refusal to accept defeat. Perhaps a little time away from the spotlight will do Winston some good.